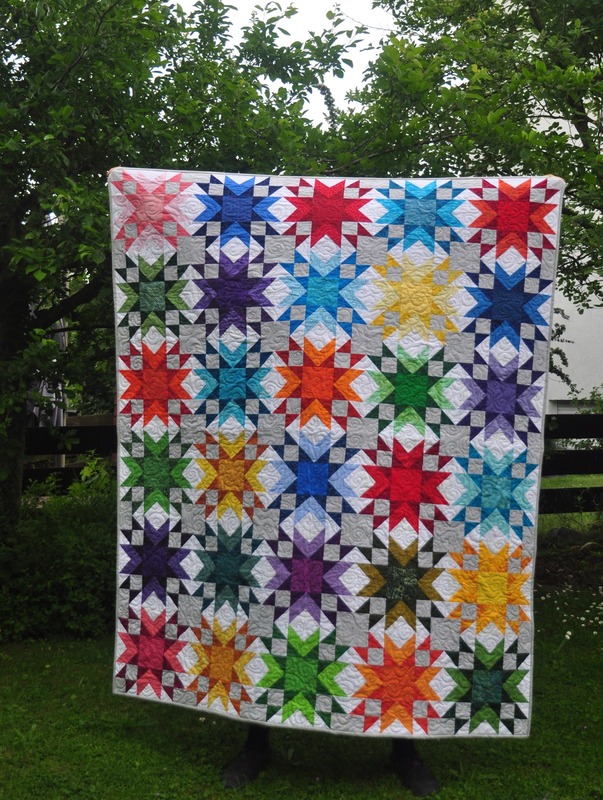 As a quilting warm up - and because the top has been finished for weeks now - I decided to finish the Double Star Quilt. 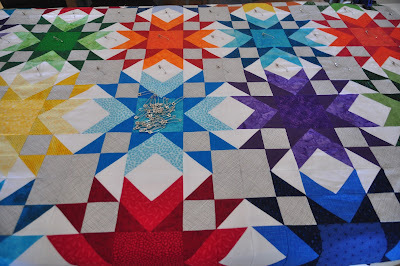 The blocks had being finished over a year ago, but for some reason I didn't sew them together into a quilt top until maybe six weeks ago. 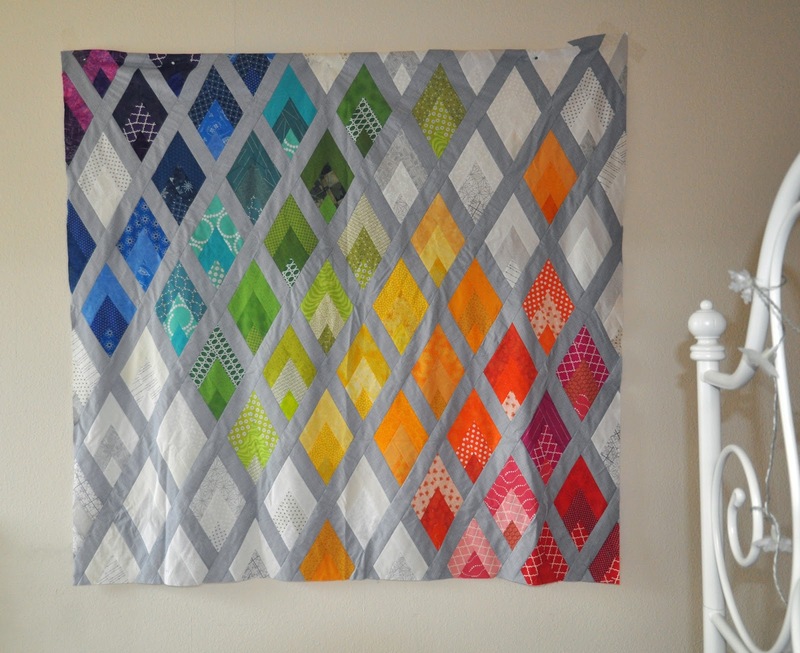 I have no idea why I waited so long, because, I do love the finished quilt. It is bright and colorful, and I adore the secondary pattern that emerged after the top was put together. 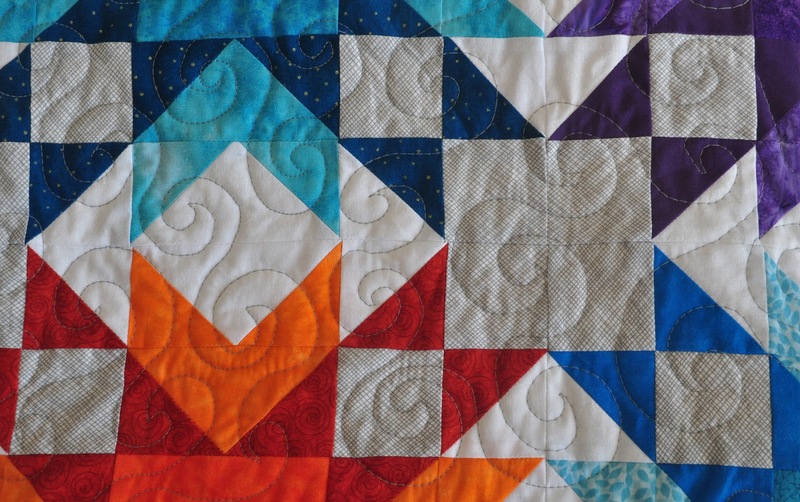 Do you see the secondary patterns? The diamond and the secondary star? I'm telling you, I'm loving it. There are quilte a few really nice quilts in the book, but the one that jumped at me and INSISTED to be made (NOW, if you please!) is called Flame. I love so much about this quilt (top so far). One, of course, is the color. Rainbow-y, but not smack in the face color-overdose (the one in the book is a lot less saturated, which is also nice, but not really what I wanted). 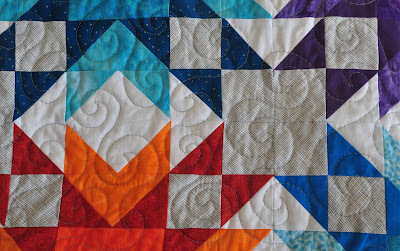 Then, the way the colors are all work so nicely with the light grey. 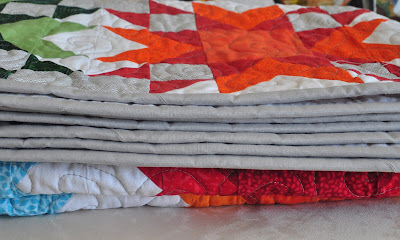 Also, I love that I've got to use one of my precious jelly rolls (it's all 2 1/2 inch stripes). There are also additional colors from my stash. So, it's sort of kind of scrappy, but very organized about it. Size is about 177 x 172 cm (69 1/2 x 68 inches), which is a really good size. The only tiny complaint if you will, there is (in my opinion) an error in the pattern. If you cut the longest part of a flame at 6 1/2 inches, it will never be enough. I usually did cut at 7 1/2 inches, and had very little in terms of trimming available. With two quilt tops finished and another one fairly close to being finished, I guess I'm going to have to do some actual quilting in the near future.